Advances in inkjet technology have print service providers asking “not if, but when” they should invest. Lower priced and wider format high speed inkjet presses may be on the way by the end of next year. 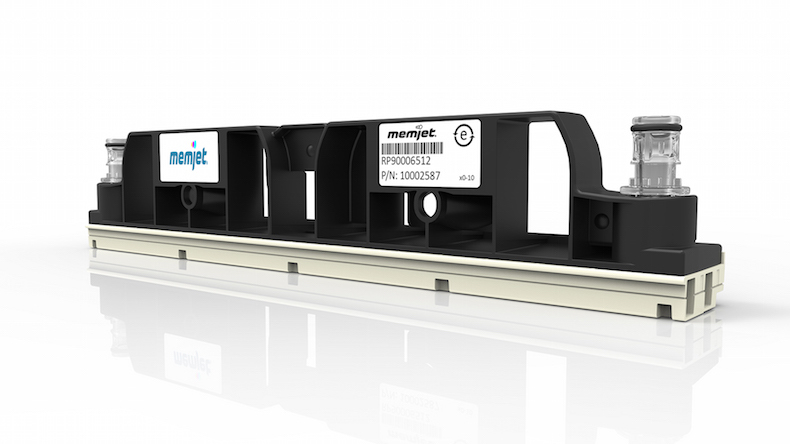 US developer Memjet has just announced DuraLink, a new generation of its single-pass inkjet printhead technology that will allow much higher printing speeds, wider printing arrays, longer head life and a more durable pigment ink. Kevin Shimamoto, chief marketing officer at Memjet, says that the company is already talking to potential developers of new commercial, carton and corrugated presses. Most are not saying anything in public yet, but an exception is Portugal based New Solution, where Stewart Bell, vice president of sales, says his company will introduce a corrugated packaging printer towards the end of next year, as a follow-up to its existing Atom and NS Pro narrow web label presses and the NS Multi 42 inch (1,067 mm) wide sheet presses that use the earlier Memjet head technology (which has now been renamed VersaPass to coincide with the DuraLink). Memjet intends DuraLink to allow OEM developers to create a new generation of commercial and packaging machines that will match today’s fastest presses for speed, but with much lower build costs. Headline figures include speeds up to 203.6 metres per minute at 1,600 x 580 dpi, with the ability to build heads into single-pass arrays with widths up to 2.5 metres. The fastest speed inkjet presses from Canon, HP and Kodak can match or exceed these speeds, but with much higher costs and lower resolutions. DuraLink can also give a series of higher resolutions at slower speeds, down to a still respectable 74.5 m per min at the maximum 1,600 x 1,585 dpi. The previous VersaPath heads have a maximum speed of 18.4 m per minute at 1,600 x 800 dpi. The new pigment ink for DuraLink has improved light and water fastness and rub-resistance compared to Memjet’s original dye inks. The company claims the result is “offset like quality” with high optical density and chroma for a good colour gamut, while the small drop sizes give sharp edges to fine lines and small text. CMYK colours will be available at first, with the possibility of more colours if customers demand them. So far the ink has been tested with 40 media types from ten suppliers, and can be used with plain papers (bond, uncoated offset); inkjet treated uncoated papers and inkjet coated media. Memjet also commissioned accelerated lightfastness tests by the independent Wilhelm Imaging Research company, which predicts an indoor life of 40 years without significant fading (note that this tends to be in protected locations behind glass and away from direct sunlight or UV light). With accelerated ozone testing the life is 25+ years. The new heads are the same dimensions as before but internally they are completely new. The DuraLink heads and inks are at the heart of a complete modular system that Memjet hopes will make it attracted for OEMs, as it makes integration easier. Gianluigi Rankin, director of product marketing at Memjet, says: “DuraLink really consists of four main components. The ink, the printhead, the modules and the data path. The ink is pigment type, with a lot more water and lightfastness compare to a dye ink. The ink and printhead together give very good quality that we refer to as ‘offset-like.’ It still allows very small drop sizes. It has a pretty wide colour gamut for a pigmented ink. The ink was optimised together with the head for high speed commercial printing applications. “Now the printhead itself, if you look at it apparently it's a VersaPass head. There are some similarities, so the width of the head is still the same. It is the same 222.8 mm (8.77 inch) width, with 70,400 nozzles, but the drop size is larger at 22 picolitres and the firing frequency is 15.5 KHz. which gives us a range of speeds anything between roughly 75 m per minute up to 203 m per minute." DuraLink is available to OEM developers as a set of modules. These are the printhead module itself (containing the ink line connections, pressure regulators and control electronics as well as the actual head), a maintenance module fitted to each head, a print bar interface module to link and synchronise multiple heads to form a printing array, and a technology module cabinet that takes plug-in function modules depending on the printer and application. DuraLink heads use a recirculating ink feed, where ink that is not jetted from the nozzles is returned to the tank. The continual flow helps to prevent gas bubbles getting into the chambers and causing misfires. Only one ink inlet and outlet is needed for all five nozzle rows. Image: This rack contains interface boards and other control and operations modules. Another improvement is symmetric ink flow into the chamber, he says. Ink enters an “antechamber” before the firing chamber, and reduces interference between adjacent nozzles as they fire, so improving the drop placement. The new maintenance module is an important factor in improved head life. The new maintenance module is a very important factor in improving the head life. It is fitted to each print head and includes a cap assembly to protect the head and stop it drying out when not in use, plus a wiper system to clean the nozzle plate, with a vacuum to extract unwanted ink to a remote waste tank. An aerosol module also uses a vacuum to extract any ink mist associated with printing, improving print quality by removing unwanted ink particles before they contaminate the substrate. Multiple heads can be built into a print bar that holds them in precise alignment, with clip-in mounts to help replacement. Heads are fitted in alternate positions in two rows in the print bar, overlapping by 10 mm to give a continuous coverage. A major difference between the new DuraLink heads and the original VersaPass type is the nozzle arrangement. VersaPass has five channels of nozzles, with each row able to jet a different colour. There are still five channels in the DuraLink head, but they all jet the same ink colour, with a single recirculating ink feed to each head. This gives a lot of redundancy, allowing users to keep on printing if some of the nozzles become blocked. However, a four-colour printer now needs four sets of heads, with associated ink supply and electronics, for every one used in a VersaPass printer. This means that older VersaPass printers cannot be simply reconfigured for DuraLink, and the new printers will cost more to build. It also means we’re unlikely to see large format sign & display printers using these heads, according to Shimamoto. Most large format inkjet printers today use a limited number of heads in multi-pass carriages to keep costs down, he points out. "The limitation for wide format will be the capital cost,” he says. VersaPass heads with their dye inks remain in production and offer speeds up to 12 inches (304 mm) per second (ie 18.24 m per minute) at 1,600 x 800 dpi and half that at 1,600 x 1,600 dpi. Printers based on single VersaPass heads have mainly been used for A4-width direct mail document and envelope printing, plus narrow web label presses. The first of these started shipping around 2010, offering a then-revolutionary combination of high speed, high resolution and low price (compared to single-pass piezo inkjet alternatives). On the other hand the high firing rate of the thermal heads meant they wore out quickly, while the tiny nozzles need for the high resolutions meant that only dye inks would work. Later on Memjet released a multi-head print bar allowing print widths up to 42 inches (1,067 mm). These have been used in plan printers (currently offered by Canon and Xerox) and a hand-fed corrugated printer (the Xanté Exelagraphix 4200 and current 4800). We have yet to see a completed printer based on DuraLink so the jury has to remain out on the claims that Memjet are making for it. However so far the indications are positive, and may allow the company to fulfil the potential of its high speed low(ish) cost head technology which now goes back more than ten years to the earliest prototype demonstrations. If DuraLink really can hit the speeds, quality and reliability being predicted, then the potential for lower build and running costs might really shake up the market for digital presses across the short-run packaging, posters and direct mail sectors. We’ll hopefully start to find out in about a year's time.